Many visitors to the Suffolk Owl Sanctuary will notice that some of the falcons here will be hooded whilst waiting their turn to participate in the thrice daily flying displays. The hood is placed on the falcon to keep the bird calm, for example when travelling or within close proximity to other birds of prey, but also to ensure that when the falconer needs to work his bird it will be alert and receptive to his instructions. Hooding a falcon in this way gave origin to the term 'hoodwinked' from the Middle Ages as it tricked the falcon into believing it was nighttime, so that the falconer could recover the prey from the bird's talons. A falcon’s sight is up to ten times as acute as a humans so, comparatively speaking, the bird is being constantly bombarded with visual stimuli. 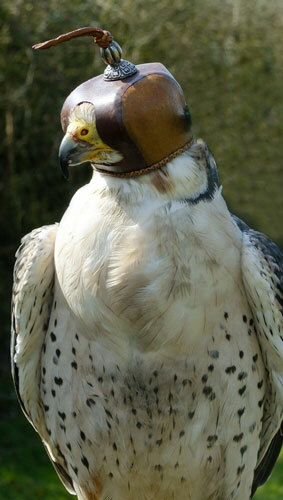 Its senses are on high alert as it registers prey targets well beyond the range of the falconer’s eyesight. Hooding the falcon, therefore ensures that it is the falconer’s target that will be the subject of the bird’s attention when the hood is removed and the bird put to flight, not a distant target that the bird has pinpointed itself, remote from the working environs. Trained daily by the falconers to accept the hood from a young age, the bird is not bothered by this covering of its head at all. It is carefully fitted to the falcon’s individual requirements for maximum comfort, being handmade from soft but durable kip leather or kangaroo leather. Kip Leather is light, very pliable and has more tensile strength than most other leathers. The fit ensures that it does not damage feathers or hamper breathing and allows air to circulate at all times. Under no circumstances does the hood ever come into contact with the falcon’s eyes - if it were to cause discomfort to any degree, the bird would reject the hood outright. The hood is arguably the most important piece of a falconers equipment, enabling a degree of control over what is essentially a wild bird and its history is a long and ancient one. It is thought to have been first introduced into the Western world from Arabia during the 13th. century by Frederick II of Germany. Frederick had observed that during the Arabian Royal Hunt: ”The practice of hooding was one of the most valuable features of their methods….as we perceived its great utility in taming falcons, we adopted it in manning our own birds and have given it our approval, so that our contemporaries have learned its use from us, nor should it be neglected by our descendants.” Never had falconers ever had such a degree of control over their birds and the practice of hooding quickly became established as a crucial element of English falconry. Over the centuries, this gentle and logical method of controlling birds of prey has never been bettered and although a whole tradition of regional hood design has evolved through the ages, it remains in essence a very small, modest but highly effective piece of equipment. The hood affords Lock the Lanner Falcon comfort and security whilst waiting to work in close proximity to other birds of prey.